Should you say "thank you" at the end of a presentation? You are here: Home / Misc. 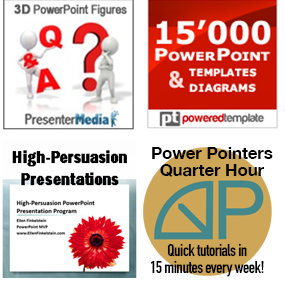 PowerPoint Tips / Should you say “thank you” at the end of a presentation? “In my home [Toastmaster] club, it has been generally accepted that the speaker does not thank the audience at the conclusion because it diminishes the impact of the ending and it is somewhat trite. The belief exists that the audience should be thanking the speaker for taking the time to prepare and share their thoughts. Do you say “thank you” at the end of a presentation? I find “Thank You” a weak ending especially when a speech deals with emotions/persuasion. I prefer to pause for a few seconds (2-3) after a power-ending before handing over the control to the Toastmaster. The audience remembers the last sentence best, so what do you want them to remember— the point you are making, the thing you want them to do, or thank you? It is speaker’s preference. I usually do say thank you because I believe it is the polite thing to do. Outside of TM world, “Thank you” is fine as part of the close. You’re not thanking them for sitting and hanging on your every word, rather for inviting you, organizing the event, contributing questions, etc. It MUST be sincere and not a throw-away line. At conferences I attend, it is usual and courteous to thank the audience at the end. The two best conference speakers I’ve heard (who get invited all over the world to speak) not only say “Thank you” at the end of every speech, but even end with a “Thank-you” slide. There’s nothing wrong with that — you’re thanking the audience for being attentive, asking good questions, laughing in the right places…. Then they thank you back, by applauding. I usually try to put a thank you in the transition leading to the conclusion – that way I make my personal thanks known (and signal the audience that the end is near) without muddying the conclusion. For TM speeches, and especially for contests, I would not say “Thank You.” For speeches outside TM, I agree that saying “Thank You” is OK, especially if you have been giving a long seminar. However, a good alternative would be to (sincerely) wish the audience well with whatever the topic of your speech has been. That is a clear signal that the speech is over and should leave them with a favorable impression. When speaking at TM, you generally do not thank the audience. If I were giving a seminar, or other training, I would ALWAYS thank the audience. At Rotary, at a professional venue, or any public presentation, I would ALWAYS thank the audience. If you NEED to thank the audience, (for going out of their way to hear you, or for them giving you an opportunity to speak), you can do it towards the end, but it shouldn’t be the last words. Toastmasters is a very formal atmosphere. Yes, you end with Mr. (Madam) Toastmaster and a handshake at the end. Who does anything equivalent in the business world? If you’re giving a sales presentation, you would always thank the audience. Why should they thank you when you’re trying to sell them something? If your CEO gave you some of his precious time to hear a pet proposal of yours, of course you should thank him or her. See my earlier post, “What goes on the last slide?” for a related discussion. What do you think? How is the answer different in different situations and for different types of content? Why would you NOT say thank you at the end of your presentation? I present 100+ times a year and close *every* show with the same Keynote slide deck: Slide 1 is blank, [dissolve transition] Slide 2 is my contact info and [twirl transition] Slide 3 is the word “Thanks!” in big bold letters. The next click starts the walk-out music playing. That is how I end my show and it works great! Audiences LOVE it! Garr Reynolds, THE presentation guru, actually thanks his audience in the very beginning. Not with a small thank you, but a BIG THANK YOU (in HUGE font). He understands that an audience could be anywhere in the world and they’re there with him, and he appreciates it. It starts the presenter-audience relationship off on a good foot, instead of the typical “this is who I am and why I’m great” diatribe most business presenters start with. It’s also a good way to avoid any awkwardness at the end. I like using this approach and ending the presentation on a slide with contact information. I guess there are two debates in parallel here – 1) should you say thank you in an explicit way at any stage, and 2) should it be the last two words out of your mouth. I think you can show your appreciation of an audience in many ways without being so blunt as to say “thank you”. I recently read Steven King’s book “On Writing” and love his concept of treating the reader as an intelligent person – it is far better to say “Ray said hello as he nervously reached for his ring finger feeling the absence of the gold ring” than “Ray’s ex wife walked in”. I don’t think “thank you” should ever be the first two or the last two words of your speech. I think a belief that you are there for them and not for yourself is transmitted or not, and the addition of two words will not change your attitude. I’ve written about the “thank you” issue on my blog as well. My opinion is that the audience is taking time away from other activities to be there listening to me speak. Without an audience, a speaker does not exist. They contribute, give value, participate, laugh, clap, and generally do their part to make the presentation work. However, I don’t believe in wasting time at the beginning with thank yous. I save it till the end, and I see nothing wrong with it being the last two words out of my mouth. I hardly think that, after everything I’ve done in a presentation, “thank you” is somehow going to give the audience a final negative impression. This is one of those “rules” that I think people follow blindly instead of doing what feels right for them and the audience. What a great topic! It’s interesting that I remember from my TM days that “Thank you” was expected to be part of my closing! Perspective is everything. My speaking engagements have been focused on technology training venues, and I’ve always thank my students at the end. It always seemed to be well received. However, during one of my full-time training jobs (I was the only professional trainer at the company) I had developed, produced, and published a number of on-demand video tutorials training customers on using the company’s proprietary software. I had based some of my design on TechSmith’s approach to their tutorials on Camtasia Studio 6. Visit http://tinyurl.com/dexsxv to see what I’m talking about. My tutorials were all under 12 minutes long. I ended them with something like, “and thanks for watching today.” There is that “dreaded” thanks! My immediate boss initially thought they were great, then for some reason, changed his mind. His comment was that (1) considering our audience (mostly attorneys in large international law firms in the USA) and (2) he objected to what he called “Toastmasters 101” paradigm of the ending thank you. He thought our audience (our paying clients) should be thanking us for our excellent, succinct training tutorials. I did edit some 25 tutorials to eliminate the objectionable “thanks.” He was so strongly opinionated abut this, that in the end he “served” me with a insubordination personnel action. So this subject can be very, very emotionally charged. Despite the reprimand, I will continue to thank my customers for participating in training events I deliver! Needless to say, I am grateful I have moved on to different pastures! I agree with Conor Neill. In India, most speakers begin their presentation with a ‘thank you’ (but not a slide) to the organizers of the event and also the audience. Having taken care of the etiquette, there may not be a need for a final slide of thanks to spoil any punchline or call for action to culminate the presentation. While TM may have its own reasons for taking its stand on ‘Thank You’, to me it appears that a thank you at the end is a deserved courtesy to the audience. Should it be the last words? Need not be. Especially if you believe like MGM in a big bang approach of earthquakes and holocausts. As some commentators have pointed out, there are many ingenious ways to convey the feeling that the presenter appreciates the audience presence, attention etc. I think saying “thank you” at the presentation didn’t matter wether at last or first part,because what’s most important is, you deliver the presentation well,the listener understand you,they pay attention to you & they will give their feedback that’s the most important.I usually say thank you at the end part of my presentation because it’s what i used to and saying it at the end is actually sying your done in your presentation,i dont say that if we say “thank you” at the 1st part is were saying your done, because your actually starting,i mean saying it at the end is my indication that im done.Anyway what’s more important is we say “thank you”. It starts the presenter-audience relationship off on a good foot, instead of the typical “this is who I am and why I’m great” diatribe most business presenters start with. It’s also a good way to avoid any awkwardness at the end.I like using this approach and ending the presentation on a slide with contact information.It’s great practice to let everyone know your done…Thanks for sharing. To be honest I don’t really think it’s a neccesary asset. At the end of a presentation there usually is a little moment for evaluation and questions by the visitors. When it’s the end u officially thank them by saying it therefore you’re not really obligated to implement it into your powerpoint aswell. nice. cool. awesome. great. bravo. (thumbs up). IT’S A YES OR NO QUESTION. WHY DOES IT NEED TO BE LONG. UGH!!! PEOPLE!! BUT NICE ANSWERS, THOUGH :D. BUT SOMETIMES, PLEASE JUST SAY YES OR NO QUESTION, IF THE QUESTION IS YES OR NO -_-. That’s the point. People think of it simplistically, but it’s really more complex than that. Just because you can frame something as a Yes/No question, doesn’t mean Yes/No will really answer the question. Choosing a good final of presentation is way of the succeed of presentation. I know it’s standard practice to not thank your audience in Toastmasters but I do it anyway and politely let the evaluator make their comment, because I feel it is a polite way of signaling the end of your speech and I’ve noticed professional speakers use it as well. Additionally, a lot of very successful comedians still take the time to thank and praise their audience at the end of their show and often times at the beginning as well. It’s fine for Toastmasters or anyone else to give advice and opinions about speeches, including if and when and where to thank the audience. But this is a decision for the speaker, not some “authority” who has made a lot of speeches or for some officials at Toastmasters. If it works for you, then do it, and in the way you want to. If it doesn’t work, don’t do it. I say it’s smart to listen to the suggestions of Toastmasters or anyone else. But once you have done that, then it’s freedom of speech! Thank you! I guess it also comes down to the presenters own personality. 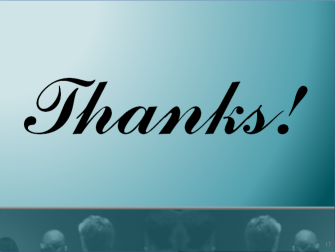 I never put a ‘thankyou’ slide in my presentations as I prefer to keep things businesslike and to the point without frivolous fancy thankyou’s during the content of the presentation. Call me inhuman if you like, I just don’t think that a fancy ‘Thank you slide’ is very professional. You may as well put smiley faces all over your presentation too and interject it with pics of your kids and the occasional youtube video of hilarious things dogs get up to when their owners are away. It also denotes submission (since you are thanking them for something that you have done) which, as a female in the workplace, I am not inclined to reduce myself to.